DOWNINGTOWN, Pa. (WPVI) -- An administrator at the Downingtown STEM Academy has resigned amid debate over a controversial video. Dr. Zachary Ruff, Dean of Student Life and Academics at the Downingtown STEM Academy, tendered his resignation to the Downingtown Area School District Board of Directors Thursday, according to a statement from the district. "Dr. Ruff, the School Board, Administration and all members of the Downingtown Area School District would like to put this terribly unfortunate incident in the past to enable everyone to move forward," the statement read. A video surfaced in late April of Dr. Ruff approaching two anti-abortion protesters on a public sidewalk outside the school during dismissal. In the video, Ruff can be heard using foul language, threatening to call the police, and stating that two locally home schooled teens were on school property and harassing students. Ruff and his attorney met with the administration. The district says Ruff was suspended without pay prior to his resignation. "In reviewing the video, Dr. Ruff knew that the conduct he displayed was not representative of who he is and was not representative of the kind of educational leader he prided himself on being. Dr. Ruff has acknowledged that the demonstrators had a right to be on a public sidewalk. He acknowledged that his conduct cannot be defended or condoned and he deeply regretted his actions as displayed on the video," the statement read. The video of the STEM Academy administrator brought a line of people from the community to Wednesday night's Downingtown Area school board meeting. 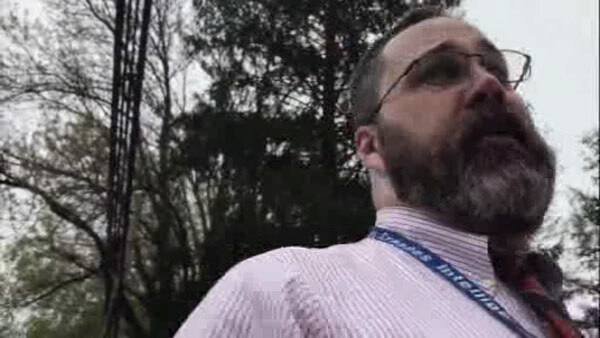 Downingtown school administrator suspended over protest tirade. Annie McCormick reports during Action News at 11 p.m. on May 10, 2017. Downingtown parent Bob Byrne said, "He himself, not anyone else, went out and said what he said. The topic of the protest was completely irrelevant." Zach Ng, a STEM Academy student, said, "We have to learn from our mistakes and firing him isn't going to be helpful learning from our mistakes." Supporters of Dr. Zach Ruff came with petitions and t-shirts with messages of support. The petitions garnered 50,000 signatures from a website that has a global reach. STEM Academy has almost 800 students. The district statement goes on to say, "After considering this situation in total, its divisive impact on the community, the reaction from his students, and the attention this situation has garnered nationally, it is clear to us that Dr. Ruff decided that the best thing for his students, the School District, and the community was to resign from employment effective at the close of business on Thursday, May 11, 2017." Downingtown's police chief said they were called after the fact, and the case is under review by the district attorney's office, and the protesters were on public property.